In geometry, to tessellate means to cover a plane with a pattern without having any gap or overlap. For centuries artists and craftsmen have used tessellation as a tool to create visual effects on surfaces. Tiling is the most common form of tessellation, and in its simplest form the tiles are regular polygons. 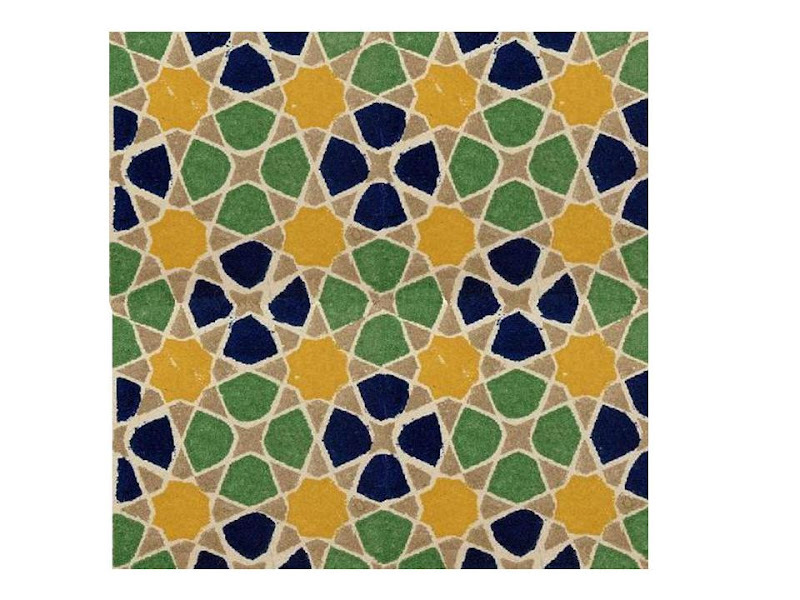 The Muslim craftsmen in Spain in the 15th century created beautifully complex visual effects by tessellating a small basic tile pattern. Intricate and complex designs can be built up from basic tile patterns in a simple way by this process. Looking at the example shown above, we may think it a difficult task to lay the multiple shapes of tiles. The nine pointed star, the four pointed, the spear head, the leaf like, etc. But in fact the seemingly complex pattern is built up simply by tiling a single basic square pattern. In tessellation planning this creative power is applied to town planning, where the colours are not merely decorative but represent functional space. Below is a demonstration how the a house, its front and backyard, and a portion of the road and park fronting it, are represented in a simple triangle (1). This basic triangle comprising the house is tessellated to form a cluster of six houses. The six houses are in turn arrayed to form a block of of thirty houses. Here, the pattern adjusted to allow for an access road into the central cul-de-sac and for bigger houses at one corner. This block is further tessellated to form a neighbourhood of 250 houses. The word geometry comes from the Greek "geometria", which literally means to "earth measurement". Sub-dividing land according to ownership and use was perhaps the first use of geometry, so the application of tessellation in this field is quite apt.